Two things to know before visiting Fisherman's Island State Park; Michigan's state stone is not really a stone and Fisherman's Island isn’t really an island. Petoskey stones, Michigan’s state stone, are actually petrified coral, leftover fragments of the many coral reefs that existed in the warm-water seas from Charlevoix to Alpena some 300 million years ago. Today beachcombing for the fossil with its honeycomb-like pattern is one of the favorite summer activities in Michigan and few places are popular among Petoskey hunters as Fisherman's Island State Park. 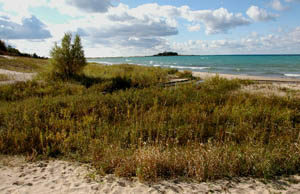 The 2,678-acre park just southwest of Charlevoix features five miles of unspoiled Lake Michigan shoreline and a park road that provides easy access to most of it. The road ends at the park’s day-use area where from the beach there is a view of Fisherman’s Island. Only it’s not an island anymore due to the lower lake levels in recent years. Now you can hike out to the islet, to search for Petoskey Stones if you want, and never have to worry about getting your feet wet. The state park also features 81 rustic campsites, including a dozen overlooking Lake Michigan and 3.5 miles of designated trails. The lightly-used trails form a pair of inter-connecting semi-loops through the undeveloped interior of the park. Away from the shoreline, the park's terrain is made up of rolling "old dunes" covered with secondary growth maple, birch and aspen forest and broken up by bogs of cedar and black spruce. The upper portion of the system is often referred to as North Campground Loop and is open to mountain biking. The lower South Campground Loop is closed to off-road cycling. 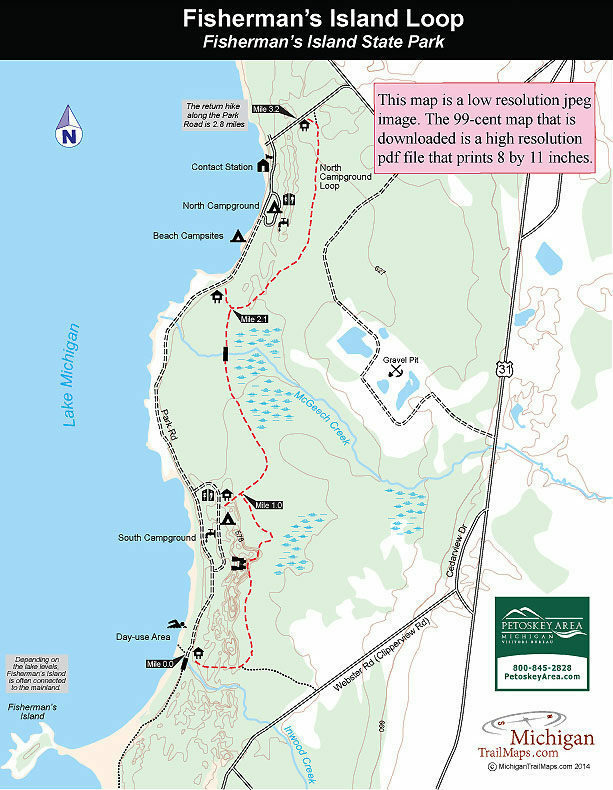 Together, along with a connector between them, the loops form a 3.2-mile hike from the day-use area to a trailhead along Bell’s Bay Road just east of the park entrance. Hiking back to your vehicle along the Park Road makes for a very scenic return and a 6-mile trek, the one described below. The most scenic section of the trail is South Campground Loop. 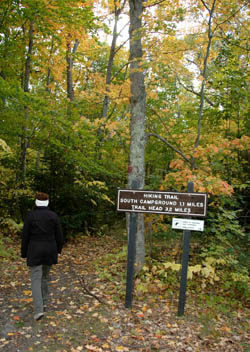 From the day-use area trailhead to South Campground is 1.1 miles or 2.1 miles with a return along the park road. The North Campground Loop with the Park Road segment is a 2-mile hike. You can begin from either end but I’ve always started out in the day-use area, where at the end of my trek I can kick back on the beach if I wish. In this parking area the trail is well-marked with a large sign and immediately enters the woods. In less than a quarter mile you come to a split with the designated trail posted with a campground sign and swinging to the north. An old two-track splits off to the right. At this point the trail climbs a wooded dune and then follows it crest. Skirting the dunes is the most interesting portion of the hike and within 0.6 miles from the start you reach a district high point where in the spring and fall, and certainly during the winter, there are glimpses of Lake Michigan through the trees. You continue to wind along the top of the dunes and at Mile 1 arrive at a posted intersection. The left-hand spur heads west and within 200 yards breaks out at a trailhead next to site No. 42 in the South Campground. Continuing north (right) at the intersection you descend to a foot bridge over a sluggish stream and then skirt a forested wetland and bog. At Mile 1.7 you cross McGeech Creek over a second bridge and within a third of a mile reach an intersection where the North Campground Loop is posted. Head right and then within 50 yards left to avoid an old trail that splits off to the east. North Campground Loop proceeds to skirt the base of a series of low, forested dunes for the next half mile. With the dunes to the west, the trail remains level and along the way passes 10 posts identifying various trees, from balsam fir and ironwood to birch and basswood. At Mile 3.2 you breakout in small meadow and arrive at the posted trailhead on Bell’s Bay Road. Head west (left) and within a quarter mile you’ll reach the park entrance. Here Park Road heads south 2.5 miles to the day-use area, staying within sight of Lake Michigan for most of that. If the day’s been hot and buggy, the breeze off the Great Lake is a welcome treat to finish off the hike. Fisherman's Island has 81 rustic sites located on two loops a mile apart. The sites are heavily wooded, well shaded and very secluded. A row of sites, 10 to 15 of them, are located right on a sandy stretch of Lake Michigan shoreline, tucked away in the trees with a table and a spot to pitch a tent only a few feet from the lapping waters of the Great Lake. These are some of the most beautiful campsites in the state park system and are often reserved a month in advance during July and August. The park has a small day-use area almost 3 miles from the contact station that features a wide, sandy beach and shallow swimming area. The facility includes limited parking, tables and vault toilets. To reach the park's main entrance, head 5 miles south on US-31 from Charlevoix and turn west (right) on Bell’s Bay Road. The posted entrance is 2.5 miles from US-31. 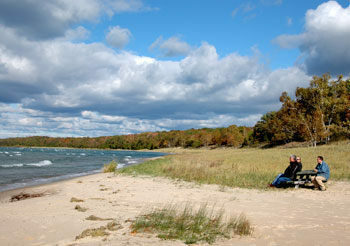 Contact Fisherman's Island State Park (231-547-6641). To reserve a campsite contact Michigan State Park Central Reservations (800-447-2757; www.midnrreservations.com). For lodging or other travel information contact the Petoskey Area Visitors Bureau (231-348-2755, 800-845-2828; www.petoskeyarea.com).